Boise State quarterback Jared Zabransky reminds UH defensive coordinator Jerry Glanville of Joe Theismann. Here's what to watch for other than rain clouds as Boise State visits Hawaii tonight at Aloha Stadium. When Boise State has the ball: Freshman running back Ian Johnson doesn't get needled much by teammates for his hobby of crocheting. That's because he makes beanies and scarves for them -- and leads the Broncos in rushing. 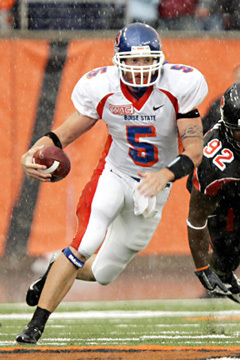 BSU paces the Western Athletic Conference in running the ball. The 218.3 yards per game on the ground comes from a variety of formations and ballcarriers. It has been called the Chameleon Offense because its appearance changes from play to play. Quarterback Jared Zabransky had a rough go in two losses, but is still a multi-threat who reminds Hawaii defensive coordinator Jerry Glanville of Joe Theismann in his prime. Junior college transfer Jerard Rabb is the top receiver. Boise State's solid offensive line is led by left tackle Daryn Colledge and center Jeff Cavender. The Warriors' outside linebackers, Tanuvasa Moe and Kila Kamakawiwo'ole, are the biggest playmakers so far in UH's 3-4 defense. Michael Lafaele often set the tone for UH at nose tackle in last week's 24-0 victory at Idaho, and he might start tonight. When Hawaii has the ball: Colt Brennan is an accurate passer and is quickly learning the finer points of the run-and-shoot offense. "He's a little bit ahead of Timmy," UH coach June Jones said when asked how Brennan compares to NCAA passing-yardage record-holder Tim Chang three games into his career. Brennan has thrown just one interception, and that was 104 passes and 28 days ago. Slotbacks Davone Bess and Ryan Grice-Mullen are the favorite targets. Like last year, the Broncos -- according to the statistics -- appear vulnerable against the pass (107th nationally), but stout against the run (first in the WAC). BSU likes to funnel the action to linebacker Korey Hall, but that's not always possible against the run-and-shoot, which spreads the field horizontally and vertically. The UH offensive line is strong, but its expertise is not run blocking. UH's running backs are inexperienced and injury-prone. Special teams: Excellence in the kicking game has been a Boise State trademark since Dan Hawkins became head coach; the Broncos have blocked 16 kicks in five seasons. Punter Kyle Stringer is among the most consistent in the nation with a 42.9 career average. Hawaii true freshman Dan Kelly has a strong leg, as evidenced by his 44-yard field goal against Idaho last week. But that was in the pristine conditions of the Kibbie Dome and things might be different at a wet, windy Aloha Stadium tonight. UH junior college transfer Andre Taylor shows promise on kick returns. He's not as shifty as Chad Owens, but he's faster. Freshman Davone Bess is UH's leading receiver with 20 catches for 194 yards. In the cyclical world of football, the wheel is coming around again to the 3-4 defense. That means Hawaii and retro defensive coordinator Glanville are ahead of the curve. The old master has forced rival offensive coordinators to rummage for ancient footage of his Gritz Blitz (Atlanta Falcons) and House of Pain (Houston Oilers) chaos-causing pressure packages that provided some of the biggest hits of the '80s. Glanville says tape of UH's shutout of Idaho last week (and the mistake-filled blowout losses to USC and Michigan State) won't help Petersen, offensive coordinator for Boise's multi-faceted attack. "We totally threw out everything that we've ever done. So, if they read this article, nothing they've seen will ever be seen again," Glanville cracked Thursday, when asked how much the Warriors can build off of last week's success against the Gem State JV. Likewise, Boise State's offensive game plan seems to start from scratch every week; Petersen, quarterback Jared Zabransky and a three-deep horde of savvy and unselfish role players are capable of everything from smashmouth to option to ball-control passing to longball -- spiced with creative trick plays that get A's for originality and six points for the Broncos. Z 82 Ross Dickerson 5-10 185 Jr.
H 1 Ryan Grice-Mullen 5-10 174 Fr. LT 70 Tala Esera 6-4 295 Jr.
LG 64 Samson Satele 6-3 311 Jr.
C 59 Derek Fa'avi 6-1 273 Sr.
RG 66 Brandon Eaton 6-2 297 Sr.
RT 72 Dane Uperesa 6-5 331 Jr.
Y 7 Davone Bess 5-10 187 Fr. X 5 Mike Washington 5-7 160 Fr. QB 15 Colt Brennan 6-3 190 So. RB 3 Bryan Maneafaiga 5-9 200 Sr.
or 48 David Farmer 6-0 240 Fr. DT 98 Melila Purcell 6-5 266 Sr.
NT 67 Michael Lafaele 6-1 297 So. DE 91 Ikaika Alama-Francis 6-5 260 Jr.
STUB 1 Kila Kamakawiwo'ole 6-3 237 Sr.
WILL 45 Tanuvasa Moe 6-0 225 Sr.
BUCK 41 Solomon Elimimian 5-11 224 Fr. MAC 43 Brad Kalilimoku 5-10 204 So. CB 35 Keao Monteilh 5-11 170 So. FS 8 Landon Kafentzis 6-0 202 Sr.
SS 15 Lono Manners 5-10 199 Sr.
CB 24 Kenny Patton 6-0 184 Jr.
P 25 Kurt Milne 5-11 208 Jr.
PK 99 Dan Kelly 6-3 199 Fr. PR 27 Andre Taylor 5-11 171 Jr.
KR 27 Andre Taylor 5-11 171 Jr.
LS 45 Tanuvasa Moe 6-0 225 Sr.
H 25 Kurt Milne 5-11 208 Jr.
Z 1 Jerard Rabb 6-2 198 Jr.
X 11 Drisan James 5-11 184 Jr.
H 4 Legedu Naanee 6-2 230 Jr.
LT 73 Daryn Colledge 6-5 295 Sr.
LG 66 Tad Miller 6-4 303 So. C 54 Jeff Cavender 6-2 287 So. RG 64 Pete Cavender 6-1 289 So. RT 79 Ryan Clady 6-6 312 Fr. TE 91 Derek Schouman 6-2 211 Jr.
QB 5 Jared Zabransky 6-2 203 Jr.
RB 17 Lee Marks 5-7 181 Sr.
FB 34 Brad Lau 5-11 255 Jr. LE 97 Nick Schlekeway 6-4 261 So. LT 99 Alex Guerrero 6-1 293 Sr.
RT 57 Andrew Browning 6-0 278 Jr.
RE 96 Mike G. Williams 6-3 244 Jr.
SAM 31 Colt Brooks 6-1 208 Jr.
MIKE 25 Korey Hall 6-1 228 Jr.
WILL 55 Chris Barrios 5-11 220 Sr.
ROV 37 Austin Smith 5-9 170 So. FS 20 Marty Tadman 5-11 176 So. LC 2 Gerald Anderson 6-0 197 Jr.
RC 23 Quinton Jones 5-9 184 Jr.
PK 47 Anthony Montgomery 6-1 215 Jr.
KO 42 Kyle Stringer 5-8 190 Jr.
H 42 Kyle Stringer 5-8 190 Jr.
P 42 Kyle Stringer 5-8 190 Jr.
SN 74 Mike Dominguez 6-2 251 Jr.
KR 23 Quinton Jones 5-9 186 Jr.
PR 37 Austin Smith 5-9 170 So.